The Great Barrier Reef contains the world's largest collection of coral reefs with 400 types of coral, 1,500 species of fish and 4,000 types of mollusc. It is one of the earliest Marine World Heritage Sites, inscribed by UNESCO in 1981. The best time to go to the Great Barrier Reef is from August to December, though you can dive here all year round. The water temperature ranges from 28 oC in March dropping to 22 oC in June. January, February and March are the warmest and wettest months. Compare Great Barrier Reef liveaboards. Book now & pay later. The Great Barrier Reef is to the northeast of Australia, in the Coral Sea off the coast of north Queensland. It comprises 3000 reefs and hundreds of islands stretching for over 2300 km. Thirty species of whales, dolphins and porpoises have been seen in the Great Barrier Reef. Reptiles are represented with an amazing 17 species of sea snake, six types of turtle. In recent years the barrier reef has faced several problems. Warming waters have caused corals to bleach - where they cast out the algae that help feed them and give the corals their colour. Without the algae, the corals turn white and, if the condition persists for too long, eventually die. The reef is also under pressure from development in Australia, farming run-off, the coral-eating crown-of-thorns starfish and coal mining. Without a reduction in these stresses the problems can only get worse, so go now! 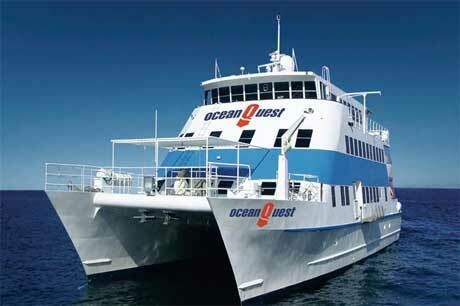 The Ocean Quest Liveaboard is a 36m Catamaran which offers year round dive trips to the Outer Great Barrier Reef in the Coral Sea. It is permanently moored at the Outer Reef: you travel there by fast boat which leaves every day of the week. The liveaboard has 23 cabins, each with en-suite bathrooms, TV and air-conditioning. Divers have the option to experience the Barrier Reef at night in a whole new way with Fluoro Night Diving which includes specialist torches and mask filters which create amazing fluorescent underwater landscapes (extra charge applies). 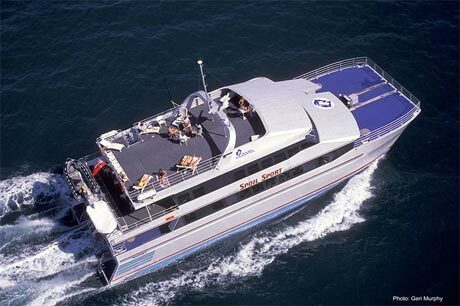 "Staying on a liveaboard vessel on the Great Barrier Reef diving was a fabulous experience. The boat amazed me, I was staggered by the degree of luxury, the size and facilities afforded. The crew were fantastic and a credit to the company they made the experience that much better also." " TUSA T5: The day trip was fantastic and the crew very professional. However, our dive master was not brilliant. Freshwater showers in the toilets and absolutely delicious lunches! One of the best boat I have been on. Excellent value for money and the equipment on the boat was all brand new. " The 30m M/V Spoilsport Australia was custom built for Mike Ball Dive Expeditions. For those prone to sea sickness, a twin hull design increases stability and reduces motion onboard. The Spoilsport offers year round diving on the Great Barrier Reef. Dive amenities include a spacious dive deck with entry and exit platforms, large camera table, rinse tanks and Nitrox. New Horizon has been operating liveaboard sailing and diving adventures from Cairns, Australia to the Great Barrier Reef since 1995. Their fleet of sailing boats includes the gaff rigged schooner Santa Maria, which does 3 day/2 night trips, and the ketch Coral Sea Dreaming, which offers an alternative for those wanting a shorter tour of 2 days/1 night. They take a maximum of 10 passengers and a crew of three.
" We went on the Poseidon from Port Douglas to dive the outer edge of the Great Barrier Reef. The operation was quite unprofessional and something happened that really spoilt our day: We dove with a guide at Just Magic, we got carried away by the currents, our guide got lost, we struggled to follow him as he was trying to go back to the boat against the currents, I used all my air and had to go back to the surface. We were a fair distance from the boat and with the currents, there was no way we could reach it. We inflated our red sausage and signed the boat but nobody saw us on the boat. It took at least 20 minutes for them to notice us and when the inflatable boat arrived to rescue us, the dive guide jumped on the boat before letting us in and my buddy was the last one on the boat! It was such a bad experience... We discovered afterwards that we could have gone with SilverSonic which is a much more professional operator. So if you go on a day trip from Port Douglas, I suggest you use Silver Sonic and not Poseidon... "
Day trips to up to 3 Barrier Reef sites (Milln, Pellowe, Flynn and Thetford reefs).
" I highly recommend the day trip to the outer barrier reef edge with Silverswift, they were very professional and everything was absolutely perfect. It was an unforgettable experience, we saw turtles, sharks, sting rays, Maori wrasses,eels, etc. " Down Under Cruise & Dive is a Cairns, North Queensland, locally owned and operated, Great Barrier Reef Cruise and Scuba Diving Company. More details or book Down Under Cruise & Dive online. "Fantastic crew and great diving. 3 day - 3 night liveaboard, diving the SS Yongala, SS Gothenburg and then finding other wrecks that are un-charted was a real buzz for the whole trip. The boat is fully air-conditioned and the bunks are first class. Cost was $565 Australian dollars (November 2004), value for money compared to other operators and boats that have been there for many years. " "Would dive with them again but definitely wont stay there. Accommodation offered by centre is poor but well worth major detour on Oz trip to dive this wreck which was awesome. Far outclassed any other dive I did whilst exploring Oz. Arrived at dive site to see 3 turtles basking in the sun on the surface. Strong current, heavy swell and had to hold on to descent line which was through a massive wall of huge barracuda and just got better. Not for the faint hearted and strong pair of legs needed to swim into current to be able to enjoy the rollercoaster drift dive back to line. Second dive was far more relaxed as I knew what to expect. Care when choosing a dive operator as our skipper had watched two divers for half an hour about 1/2 mile from their boat who he then picked up once we were all back on board - their skipper didn't even know they had surfaced - worrying! Strongly recommended and already planning next trip. " A Booking Agency and advisory service for diving involving 65 vessels out of Cairns and the east Coast of Australia. "Pro-Dive cronulla took me for a learner and they were amazing and very patient with someone who has let themselves go (just a little bit). Have completed all my other dives with them. I have found them very accepting of all levels of diver. " "Access the latest scuba events and scuba diving courses in Sydney with ADH Divers. Have a blast learning to dive with the best scuba course Sydney has to offer. Accommodation and boats are good and affordable. Overall service is better than others. " An excellent, comprehensive guide to reef fishes, which is small and light enough to pack regardless of amount of diving equipment. Highly recommended for anyone wanting to identify the fish they see whilst diving the tropics. 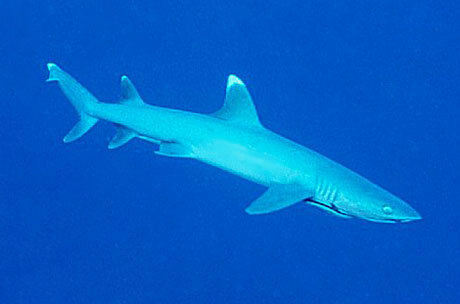 Want to recommend an Australian dive centre or liveaboard? Fill in this form.